This photo is © Diamond Envy. This 2.30 carat Internally Flawless pear shaped Natural Fancy Light Blue diamond ring makes an extremely rare statement. The color is an astonishing icy blue with outstanding brilliance and light return. This diamond sparkles like no other and is framed by a halo of melee diamonds that also accent the upper parts of the shank, 0.20 ct. tw. 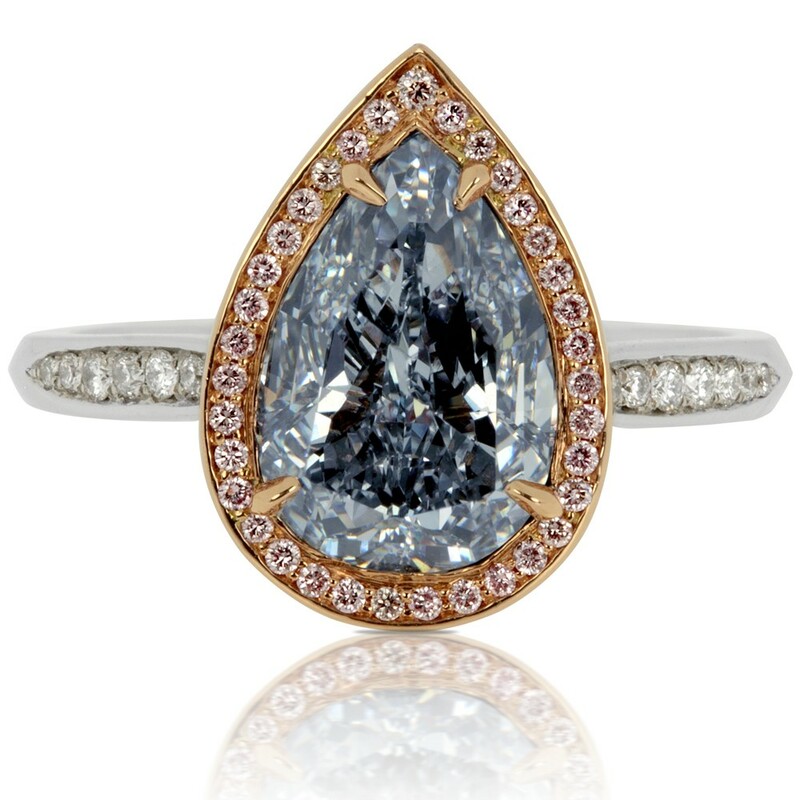 The one-of-a-kind blue diamond has a perfect Internally Flawless clarity. Center stone is GIA-certified. PLEASE NOTE: This item is sold. We have kept the listing active to help inspire your own custom design project. Contact our design team to create something similar, or another style you like. The color grade for a fancy color diamond is the most important factor in determining the diamond's value and price. First a dominant hue is determined. If there are any other colors in the diamond, a modifier is added to the color. For example, a diamond's color may be graded as "Pink" or "Purplish Pink." In some cases there is an equal amount of more than one color so the colors are hyphenated—for example, a Purple-Pink diamond. The intensity of a diamond's color is based on two things—tone and saturation of the diamond's hue. The intensities the GIA uses to modify each color grade are Faint, Very Light, Light, Fancy Light, Fancy, Fancy Dark, Fancy Deep, Fancy Intense, and the most coveted Fancy Vivid. A diamond's value is directly related to its saturation and tone. The stronger a diamond's saturation (Fancy Intense and Fancy Vivid), the more valuable the diamond is. The deeper the tone of the color (Fancy Dark and Fancy Deep), the richer the color appears. How well a stone is polished may determine how well the diamond reflects and refracts light. The GIA polish grades are excellent (EX), very good (VG), good (G), fair (F), and poor (P). At Diamond Envy, we only carry diamonds with EX, VG, and G polish grades. A diamond's symmetry affects the pattern of light and shadow within the stone. Symmetry is one of the factors the GIA uses to grade the design and craftsmanship of a diamond. The GIA symmetry grades are excellent (EX), very good (VG), good (G), fair (F), and poor (P). A round brilliant's measurement is written as minimum diameter –maximum diameter x depth. A fancy shape's measurements are listed as length x width x depth. All measurements are taken in millimeters. A certificate from an independent gemological lab provides you with a comprehensive list of the diamond's grades. It also includes a map of all the inclusions or blemishes a diamond may have. Since no two diamonds are alike, this map is often referred to as the diamond's fingerprint. All our loose diamonds are certified by the GIA. All our jewelry is certified by either the GIA or EGL. A color diamond's beauty and rarity comes from its color, so most are cut to the shape that best shows that color off. Anything other than a round brilliant cut is referred to as a fancy cut. This includes pears, hearts, ovals, marquises, radiants, cushions, asschers, emeralds, and princesses. 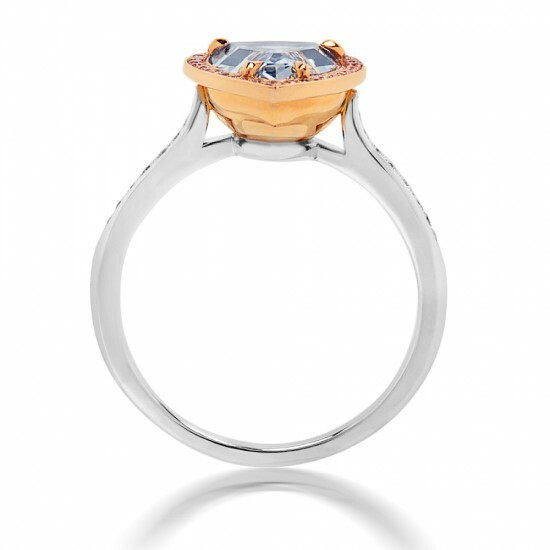 Brilliant cuts have facets shaped like kites and triangles that sparkle with color when rocked. 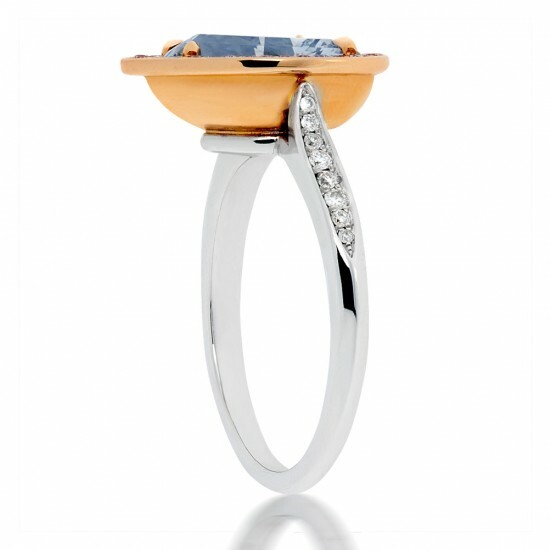 Step cuts have straight facets making them an excellent choice for showing off the clarity of a stone. The clarity of a diamond is determined by how many inclusions or blemishes it may have and how noticeable they are. The GIA clarity grades are flawless (FL), internally flawless (IF), very very slightly included (VVS1, VVS2), very slightly included (VS1, VS2), slightly included (SI1, SI2), and included (I1, I2, I3). In general, any diamond graded SI1 or higher will be eye-clean. The distinction between the higher grades is in how difficult it is to find an inclusion using a loupe with 10x magnification. The depth percentage of a diamond is the ratio of its diameter compared to its depth. Some diamonds fluoresce blue or yellow under long-wave UV light. The GIA grades fluorescence by color and strength—strong, medium, faint or none. Unless a diamond has strong fluorescence, it is unlikely to affect the diamond's appearance. Diamonds are measured by carat weight (not to be confused with gold karats). The more a diamond weighs the rarer and more valuable it is. Therefore, a 3.00 carat diamond will cost more per carat than three 1.00 carat diamonds. In a piece of jewelry with more than one diamond, the combined carat weight for all the diamonds listed is referred to as minimum carat weight or total carat weight. Rings are sized in quarter measurements. The average women's ring size is 6-7. To request information on ring sizing, please call one of our diamond sales representatives at 888-918-8288. There are many ways to set a diamond. A prong setting maximizes the amount of light that can pass through a diamond. Bezel settings create the look of a smooth finish. Channel set diamonds sit side by side between two rows of metal. Pavé set diamonds tend to be small and are laid smoothly into the metal to resemble the source of the word—pavement. This photo is ©Diamond Envy.